3/30/2011Share this story on Facebook! 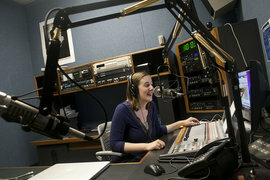 Author Nicole Ogrysko '13 on the air in WICB's updated studios. It's 4:00 a.m. Thursday morning. While the rest of the Ithaca College campus is sound asleep, an IC student sits in the WICB studio, poised at the microphone to begin the first talk-set of the morning. "92 WICB, it's commercial-free modern rock..."
This is a typical scene for every beginning Ithaca College DJ, who after a few weeks of training, is ready to sit behind the microphone and experience the workings of an FCC-licensed, student-run radio station. From news and sports to promotions and audio production, IC students operate all facets of the station for innovation, which airs for 24 hours every day of the year. This semester has been a particularly exciting one for WICB. The station recently renovated the studio in January with new microphones, speaker system, and sound proof padding on the walls. Sophomore DJ and promotions director Bianca Nicolosi said it was exciting to return to school after winter break and see the renovations. "It's is a 360 transformation," she says. "We have a really nice set-up now. The record players are hidden under the desk, and everything is more organized." Currently ranked number two as the Best College Radio Station by the Princeton Review, ICB was also just voted in the top 10 for the MTV Woodie Award for Best College Radio Station in March. Any IC student can get involved in a variety of music programs on the station, from modern rock and city rhythms to jazz. Interested DJs can sign up at the beginning of each semester.